Aalto, Grabbe, Mathson, Risom: what do these four giants have in common? They all used webbing in some of their most famous designs. There is something both elegant and cheap to furniture using webbed canvas, and for a good reasons as often these designs were borne out of necessity. Aalto is the precursor, with his Model 406 “Pension” Chair, designed in 1933 and a successor to the Model 41 armchair, with a higher back for comfort. But what makes this chair remarkable is the use of a cotton canvas webbing after many years of experimentation with laminated wood. The webbing offers smoother support and better airflow. Bruno Mathsson successfully borrowed from Aalto the use of canvas webbing, which offered lightness and durability. Mathsson experimented with different woods and webbing materials from jute to paper. Further reading can be found here courtesy of Webvg. Jens Risom used webbing for his first collection for Knoll in the US. Wartime restrictions lead him to use webbing made out of parachute fabric and walnut. We particularly like the use of color in his designs. Like Risom, Klaus Grabbe used military fabric due to wartime restrictions for his 1948 Chaise Longue. 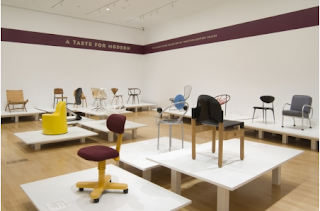 The thick exagerated section is very reminiscent of Risom’s chair, but made of plywood. Breuer is said to have inspired Grabbe, who also designed this other pretty striking reclining model . 1. We are not usually fans of the craft/organic school of design, but we are nevertheless open to exceptions, such as the Tree Table by Carl Auböck. 2. Jean Royère “wave” lamp (does anybody know the real name?). UPDATE: it’s called “Serpentin” and featured in this auction. The most expensive floor lamp ever? $ 185,925 – this is the price fetched at the 16 February Artcurial auction by an interior lamppost similar to the ones in La Cité Radieuse in Marseilles and Villa Shodan in Ahmedabad. Overall the Artcurial sale that we mentioned in our earlier post, sold pretty well in the current context, with 80% of the lots sold (for the furniture) and several pieces going well well above the estimate. The lightings went for very high hammer prices, which seems justified given how unique they are. A link to the catalog is here. An unlikely place where to find one of the most important collections of Aalto furniture in North America (don’t miss the building either). Another catch up session: an interesting article courtesy of Antiques via Modern Magazine on Jeanne Rymer, former UD professor. For once a “regular Jane” (sorry: could not resist) collector. A refreshing change from gazillionaires who overpay for their art. We wish we had been able to see the exhibit of her collection. Alright, we only saw it this week: a very good article on Kem Weber one of America’s early modernists in last May’s Antiques (HT to Modern Magazine). 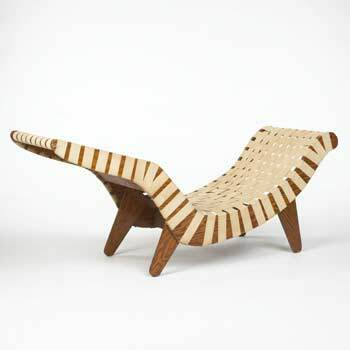 If you like his designs, Wright Now has a nice pair of lounge chair on sale (click on image below).